Amelia Mary Earhart was a renowned American aviation pioneer, best-selling author and the first woman ever to fly solo across the Atlantic Ocean. She was the daughter of a German-American Lawyer Samuel “Edwin” Stanton Earhart and enjoyed all comforts of life. She made several significant records during her lifetime and received the United States’ Distinguished Flying Cross for her achievements. Earhart was also an active contributor and supporter for the Equal Rights Amendment and a member of the National Woman’s Party. Prior to attending flying course, she managed to save $1,000 by doing a variety of jobs that included working as a truck driver, photographer, and stenographer at the local telephone company. Earhart took flying lessons from a pioneer female aviator Anita “Neta” Snook. In 1921, she made her first solo flight and within one year she managed to buy her own plane. Later, on June 17-18, 1928 she received a call from Captain Hilton H Railey asking her to join pilots Louis Gordon and Wilmer Stultz as a passenger on a flight from the United States to England. Thus she became the first woman to cross the Atlantic. In 1931, She married George Putnam at the height of media attention. In 1932, Earhart dared to cross the Atlantic alone and set a new transatlantic crossing record. She was honored with a medal from American President Herbert Hoover for her bravery and courage. Her last flight began in June 1937 with navigator Fred Noonan to fly around the world. They took off from Miami in America to South America and crossed the South Atlantic Ocean to Dakar in Africa from where they went to Thailand and Australia. After that they left Lae in New Guinea for Howland Island but suddenly the American coast guard lost contact with their plane. Their final message came on July 2, 1937 at 8:45 am after which they were never found. How they disappeared is still a mystery today. In 1939, she was declared dead along with her co-pilot Fred Noonan. 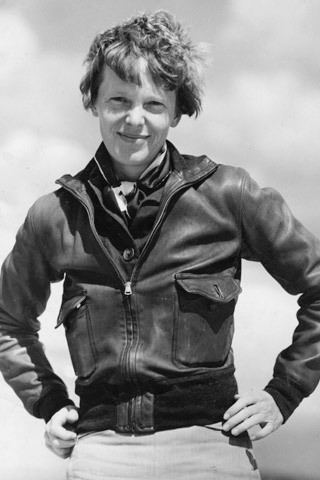 In her life time, Earhart made several records: In 1922, She became the first woman to reach the altitude of 14,000 ft. In 1931, she became the first woman to fly a gyroplane and reached the altitude of record 15,000. In 1932, flew across the United States in her gyroplane. In 1932, she became the first woman to cross Atlantic twice. In 1933, she became the first woman to fly nonstop, coast-to-coast across the U.S. In 1935, she became the first person ever to fly solo across Honolulu, Hawaii and Oakland, California. Earhart also worked as the aviation editor for the Cosmopolitan magazine between 1928 and 1930. She wrote three books titled 20 Hrs., 40 Min. published in 1928, The Fun of It published in 1932 and Last Flight which was published in 1937 after she disappeared along with her co-pilot. Amelia Earhart’s success story is an inspiring example for every woman who aspires to achieve the impossible.